When I was younger, I struggled for the longest time trying to remember which was the dividend and which was the divisor. I honestly had the “I don’t care” attitude. I wondered just why I had to learn it. I figured as long as I knew how to divide, that should be all that mattered. I was not a fan of division vocabulary. Honestly, many, many years later, I still don’t know exactly why I had to learn it because I know which number gets written where. I know how to divide but I still have to teach the vocabulary and make sure students know what is what. So, I came up with a few tricks of my own to help students out a bit. I always gather my students around and have them draw this. First I start with the top of the house. I tell students this is the Quotient. “The quotient is located in the attic with the queen.” I help students see that both queen and quotient start with a Q. They draw their queen in the attic and label it Quotient. Then I move to the word Dividend. This one is the easiest for the kiddos because it has two words in it- divide and end. Students always seem to notice words inside of words. I tell them, “you divide in the den.” You do not want to tell them that the bigger number goes inside the house, as that will confuse them later with decimals and other numbers. Finally, I always point out the various ways that division is written – the fraction and using the symbol. However, it’s easier to start with the first method of drawing a “house” before teaching the others. Also, make sure as you are explaining each word’s location, you are also explaining the meaning of the word in division. One final thought… I have this page here for you to download and pass out to your students if you wish. It’s from my Multiplication and Division Math Workshop Unit. And I’m willing to bet that if you are teaching division, you still have some cute little ones in your class that need some help with their multiplication facts, am I right? Why not check out my post 5 Tricks to Help Your Students Learn their Multiplication Tricks (and there’s a freebie!)? Also, consider checking out my Multiplication Strategies or Multiplication Shortcuts post! 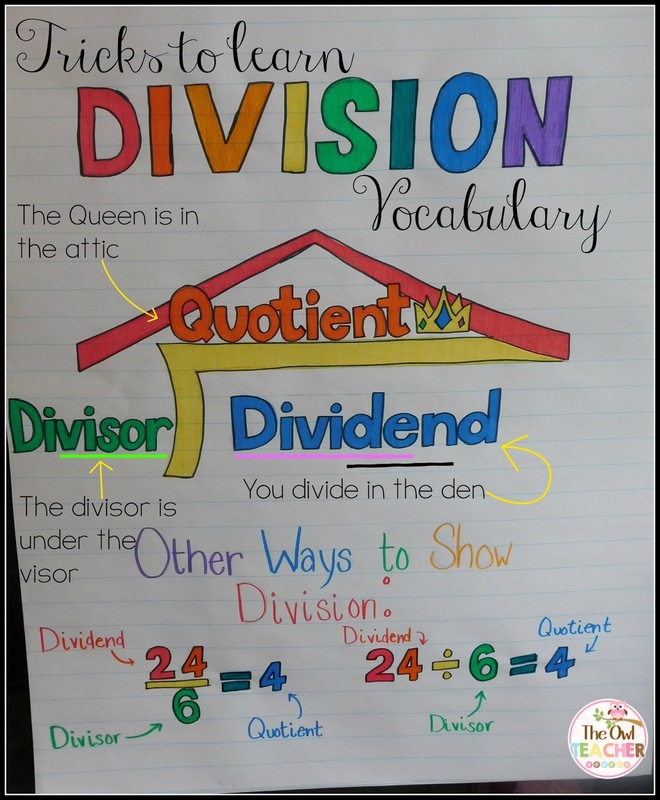 You can download this FREE division vocabulary anchor chart by clicking here. Your poster looks so cheerful and easy to read! I love your way of explaining the set up of long division by using clues inside the correct terminology that students can identify and relate to. Also, helping students see the relationship between the different ways to write a division problem by color coding the different parts can be very helpful! 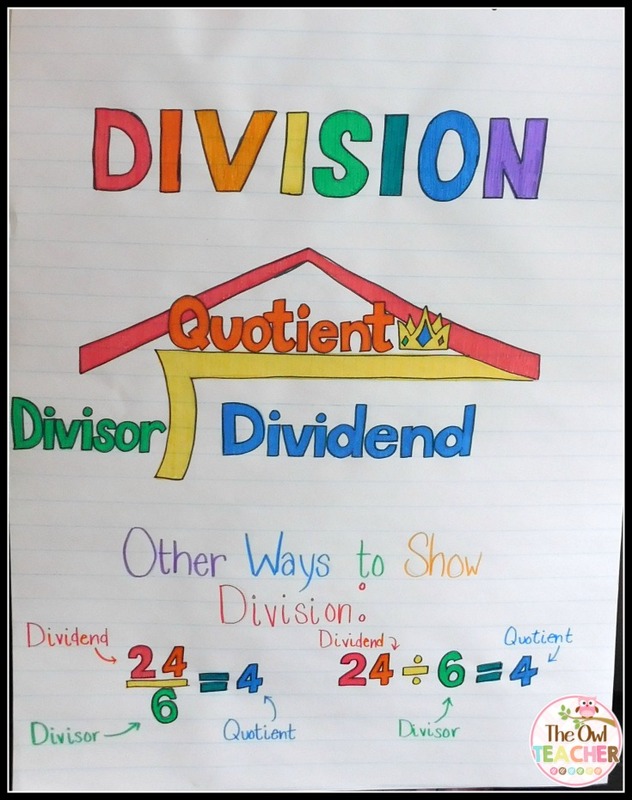 But here in your poster it’s a little confusing because the colors used for quotient and dividend are reversed when you show long division vs. the other ways.